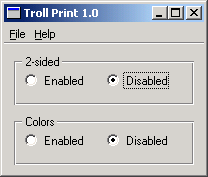 Troll Print is an example application that lets the user choose printer settings. It comes in two versions: English and Portuguese. We've included a translation file, trollprint_pt.ts, which contains some Portuguese translations for this example. The PrintPanel class is defined in printpanel.h. PrintPanel is a QWidget. It needs the Q_OBJECT macro for tr() to work properly. The implementation file is printpanel.cpp. Some of the code is commented out in Troll Print 1.0; you will uncomment it later, for Troll Print 1.1. Notice the two occurrences of tr("Enabled") and of tr("Disabled") in PrintPanel. Since both "Enabled"s and "Disabled"s appear in the same context Qt Linguist will only display one occurrence of each and will use the same translations for the duplicates that it doesn't display. Whilst this is a useful timesaver, in some languages, such as Portuguese, the second occurrence requires a separate translation. We will see how Qt Linguist can be made to display all the occurrences for separate translation shortly. The header file for MainWindow, mainwindow.h, contains no surprises. In the implementation, mainwindow.cpp, we have some user-visible source texts that must be marked for translation. We must translate the window title. We also need to translate the actions and menus. Note that the two argument form of tr() is used for the keyboard accelerator, "Ctrl+Q", since the second argument is the only clue the translator has to indicate what function that accelerator will perform. The main() function in main.cpp is the same as the one in the Arrow Pad example. In particular, it chooses a translation file based on the current locale. We will use the translations in the trollprint_pt.ts file that is provided. Whilst the translation has appeared correctly, it is in fact wrong. In good Portuguese, the second occurrence of "Enabled" should be "Ativadas", not "Ativado" and the ending for the second translation of "Disabled" must change similarly too. If you open trollprint_pt.ts using Qt Linguist, you will see that there is just one occurrence of "Enabled" and of "Disabled" in the translation source file, even though there are two of each in the source code. This is because Qt Linguist tries to minimize the translator's work by using the same translation for duplicate source texts. In cases such as this where an identical translation is wrong, the programmer must disambiguate the duplicate occurrences. This is easily achieved by using the two argument form of tr(). Now run lupdate and open trollprint_pt.ts with Qt Linguist. You should now see two changes. First, the translation source file now contains three "Enabled", "Disabled" pairs. The first pair is marked "(obs.)" signifying that they are obsolete. This is because these texts appeared in tr() calls that have been replaced by new calls with two arguments. The second pair has "two-sided" as their comment, and the third pair has "colors" as their comment. The comments are shown in the Source text and comments area in Qt Linguist. Second, the translation text "Ativado" and "Desativado" have been automatically used as translations for the new "Enabled" and "Disabled" texts, again to minimize the translator's work. Of course in this case these are not correct for the second occurrence of each word, but they provide a good starting point. Change the second "Ativado" into "Ativadas" and the second "Desativado" into "Desativadas", then save and quit. 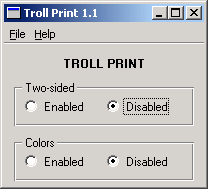 Run lrelease to obtain an up-to-date binary trollprint_pt.qm file, and run Troll Print (or rather Troll Imprimir). The second argument to tr() calls, called "comments" in Qt Linguist, distinguish between identical source texts that occur in the same context (class). They are also useful in other cases to give clues to the translator, and in the case of Ctrl key accelerators are the only means of conveying the function performed by the accelerator to the translator. In this application the whole application is a MainWindow. Try adding these comments to some source files, particularly to dialog classes, describing the navigation necessary to reach the dialogs. You could also add them to the example files, e.g. mainwindow.cpp and printpanel.cpp are appropriate files. Run lupdate and then start Qt Linguist and load in trollprint_pt.ts. You should see the comments in the Source text and comments area as you browse through the list of source texts. now see a pop up window with the text "Error: Name too long!". This window is a ZClientErrorDialog. Uncomment the two lines that create a QLabel with the text "<b>TROLL PRINT</b>" in printpanel.cpp. Word-tidying: Replace "2-sided" by "Two-sided" in printpanel.cpp. Replace "1.0" with "1.1" everywhere it occurs in mainwindow.cpp. Update the copyright year to 1999-2000 in mainwindow.cpp. 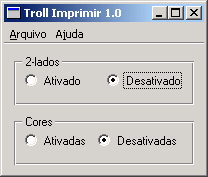 Troll Print 1.1 - automatically translated as "Troll Imprimir 1.1"
About Troll Print 1.1 - automatically translated as "Troll Imprimir 1.1"
Troll Print 1.1. 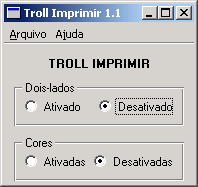 Copyright 1999-2000 Software, Inc. - automatically translated as "Troll Imprimir 1.1. Copyright 1999-2000 Software, Inc."
Two-sided - unmarked, i.e. untranslated. Notice that lupdate works hard behind the scenes to make revisions easier, and it's pretty smart with numbers. Go over the translations in MainWindow and mark these as "done". Translate "<b>TROLL PRINT</b>" as "<b>TROLL IMPRIMIR</b>". When you're translating "Two-sided", press the Guess Again button to translate "Two-sided", but change the "2" into "Dois". Choose Ajuda|Sobre (Help|About) to see the about box. If you choose Ajuda|Sobre Qt (Help|About Qt), you'll get an English dialog. Oops! Qt itself needs to be translated. See Internationalization with Qt for details.